Doctor Who: Companion Pieces - RIVER SONG | Warped Factor - Words in the Key of Geek. Stacy Embry cries River, "where the hell were you?" Caution: SPOILERS deliberately peppered throughout! 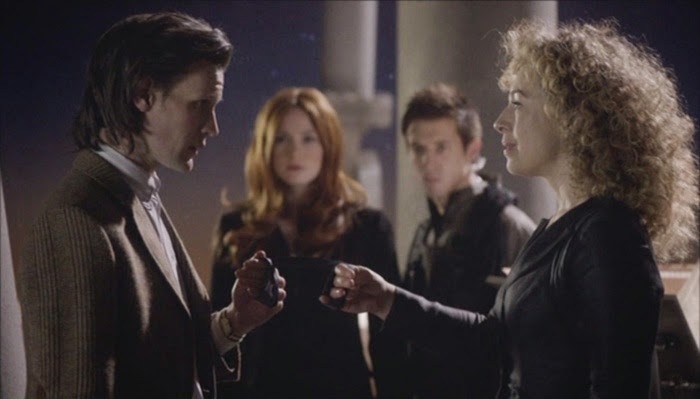 Arriving at Demon's Run, River Song coyly entices the Eleventh doctor over to his own cradle with "I haven't seen this in a while." Short with her, he demands: "Who are you?" As loyal Whovians, we want to know, too. 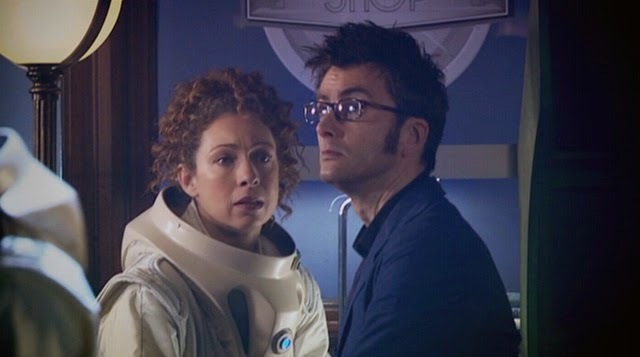 River Song first arrived in the Doctor's life during his adventure in The Silence In The Library. The Tenth Doctor was taken aback, and after confusion leading to annoyance, then clearly impatience to anger, he watched her die. Not actually knowing her, but believing her value proved by her whispering of his real name, David Tennant's Doctor grieves for this amazing stranger who loves his future self so much that she chooses to die for him. The expression on his face, as a handcuffed hostage to her sacrifice, shows his distraught awareness that this tragic heroine is his wife. The glory of Alex Kingston is on full display as she martyrs herself for our beloved Doctor. But, is she really his wife? After all, River and the Eleventh Doctor married in an alternative universe while time was dying. If Amy didn't kill Madame Kovarian there, did these two actually marry there? The Eleventh Doctor said he didn't want to marry her in the same episode, but we, the viewers, know he has to so she will go back in time and save the Tenth Doctor in a catch-22. So I ask, with all that at stake, how could he authentically fall in love with her when he is required to do so? Wait, I'm getting ahead of myself. In a profile article, I should remind you why, not how, Alex Kingston's River Song came to be. Conceived in the TARDIS while it was traveling in the time vortex on their wedding night, she is the daughter of companions, Amy and Rory Williams. Born as Melody Pond, her name was translated into the language of the Gamma Forrest which then became translated by the TARDIS' matrix into the alternative nomenclature, River Song. Embroidered by a former resident Gamma girl, Lauren Bucket serving in the battle of Demon's Run, River's name appeared on a silken prayer leaf when revealed to her shocked parents. Then stolen as a baby and raised on earth, the human/Time Lord hybrid becomes regenerated into Mels--- Melody for whom the baby was named, a childhood friend of her not-yet-married parents, Amy and Rory. For the viewer, her complete story is crystalized in the episode, Let's Kill Hitler. Not only convinced she is the Doctor's savior then, foreshadowing her first and previous appearance, River gives her remaining regenerations to save the Eleventh Doctor after she had poisoned him in a notably Shakespearean fashion. Matt Smith's Doctor has to manipulate her into using her lives on him... thus saving his life and ensuring she remains the River Song the Tenth watched die. Yet, it's not this simple... or as complex, as it may sound. Brilliantly portrayed by Ms. Kingston, a classical actor in her own right, this complex character belies the position as guest star, but cannot really serve as a companion per-say. After all, there is only "one psychopath per TARDIS" as she says in Angels Take Manhattan. 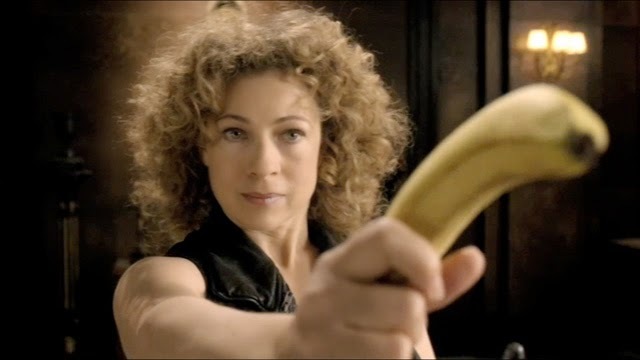 A truly memorable character, and though there is talk of her returning to be with the Twelfth Doctor, to be cast as her better onscreen fit, the role of River Song feels finished. Unless there's a connection to Clara Oswald, (after all we met her with a leaf as well), I believe it would be better to move the series onward. The chemistry Capaldi's Doctor and River Song would have could be achieved by a number of actresses, not just Ms. Kingston--maybe not as well, but then again perhaps even more palpably powerful. Plus, to many of us, she is the Eleventh's wife. Even Matt Smith has been quoted saying to the Moff, "please don't take River." I like leaving her as a data ghost, a final conscious imprint, in CAL's dream. I like the end being the beginning and River belonging solely to the Eleventh who fulfilled his role to justify her sacrifice. He does seem to love her when he kisses her image goodbye in The Name of the Doctor. And, he has ardently and knowingly recreated every memory she lists to the Tenth in Silence in the Library. He's done her right... and has real pride whilst saying in The Time of the Doctor that "I would never have gotten here [Trenzalore] without River Song." So, what do you think? Should she be integrated into Capaldi's reign.... is she related to Clara via the leaf motif hidden in plain site, or should the obvious Twelve/River chemistry (potentially more believable than Eleven/River) drive the reintroduction of her character into the Whoniverse? I'd love to hear your take on Dr. Song's role in Doctor Who. Risk-adverse, Stacy Embry would not even enter the TARDIS in case it suddenly set to motion. Yet, gentle reader, she feels compelled to clarify that she writes opinion or editorial pieces. By using logic and reasoning, she always hopes to coherently provoke honest discourse.